Fox’s plans to celebrate its 25th anniversary with a prime-time special and a limited revival of its breakthrough sketch-comedy series In Living Color are starting to take shape. 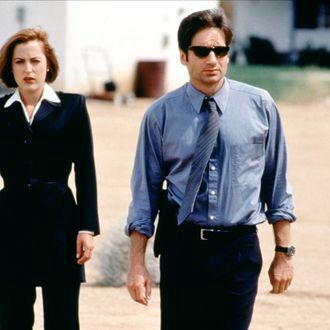 Vulture hears that silver anniversary special producer Don Mischer has booked The X-Files stars David Duchovny and Gillian Anderson, along with creator Chris Carter, for a segment in which they’ll finally answer every remaining question about the show’s many mysteries. (Okay, we made that last part up.) Mischer has also put together a Married … With Children reunion featuring all four core cast members: Ed O’Neill, Katey Sagal, Christina Applegate, and David Faustino. (Clearly there’s no bad blood there to set aside: They’ve previously gotten back together for a 2003 special, a TV Land awards show, and Entertainment Weekly’s 2010 reunions issue.) We also hear the network is even planning on honoring some of its shows that didn’t last that long, with The Tick star Patrick Warburton slated to get some airtime. No word yet on any appearances by the stars of other Fox landmarks such as Party of Five, 21 Jump Street, or Mr. President, but Fox’s 25th bash is set to air April 22. Meanwhile, the In Living Color reboot is also moving forward, though the timetable may be shifting a bit. Originally, there was talk two specials could air as early as April, as part of the Fox 25 festivities. While casting has begun (unknown comics “LilRel” Howery and Jermaine Fowler have already landed gigs), rehearsals and preliminary production won’t start until the first week of April. Fox sources now say that while it’s possible the two specials could still air this season, most likely in May, there’s also now a chance their airdate will be pushed back until later in the year.